Now all of have heard of the odd dog or cat, and sometimes even a goat falling into a well but it's for the first time I heard, "An elephant has fallen into a well!" I know you might just be thinking I am mad but it really happened here. Elephants had been in the news the last couple of months. 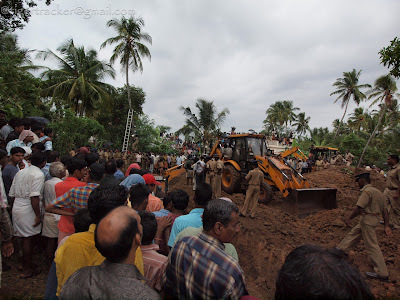 In Walayar, in Pudussery, in Malampuzha; all along the Palghat gap, for all the wrong reasons. They were crop raiding and searching for water and had even trampled a tribal woman to death. Summer has been very torrid for these gentle beasts and they could not all be blamed for the troubles they caused. 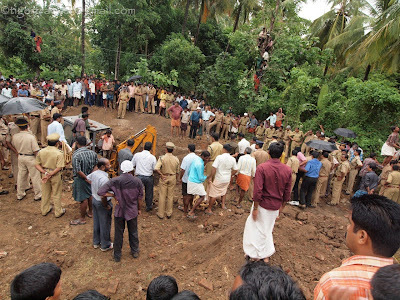 Farmland on the fringes of the forest were mostly encroachments and blocked the elephants' access to the water sources. Apparently a herd of 6 elephants had been wandering around the farmland around Pudussery village since late last night. Like us folks taking an occasional break in the jungles, the pachyderms decided to visit the concrete jungle! I was wondering what they found interesting in the middle of human habitation because it was a tightly packed maze of houses (more than 1000 according to a local!) with not much by way of edible material that elephants are fond of. Anyway, they blundered through the road, probably lost and confused in the dark, till one of them suddenly disappeared from sight. The others, perhaps even more confused by this sudden disappearance of their friend wandered aimlessly finally ending up in an artificial forest in an industrial township. Someone called me up and told me about an elephant in a well as I came home for lunch. I just grabbed my camera bag and ran, not bothering to check if the battery had any charge in it. When I reached the place the narrow road was lined with the fire force, policemen, forest officials, and hordes of excited people brandishing their cell phone cameras. I could not get close enough to the well mouth as it was cordoned of so I lifted my camera over my head and pressed the button. BATTERY EMPTY, my LCD display said! Anyway, cursing my luck I backtracked. The wise people standing around told me it would take all day and probably the whole night before the operation was wound up. I returned because I couldn't keep patients waiting in the clinic. Besides my son would not be very pleased if I went off alone again. Winding up practice early, packed my son and niece in the car, and this time took the standby camera and sped off again. The elephant was still there, and so were a few hundred people, braving the light drizzle. The TV crew were there and the press too. Everyone wanted a look and the guardians of the law were having a rather tough time. 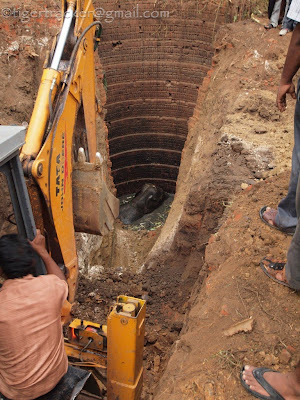 The earth movers were shoveling earth around the mouth of the well, trying to create a slope into one side of the well so that the elephant could climb out. Now, if you don't know, there are no elephants trained in rock climbing as far as I know, anywhere in the world! 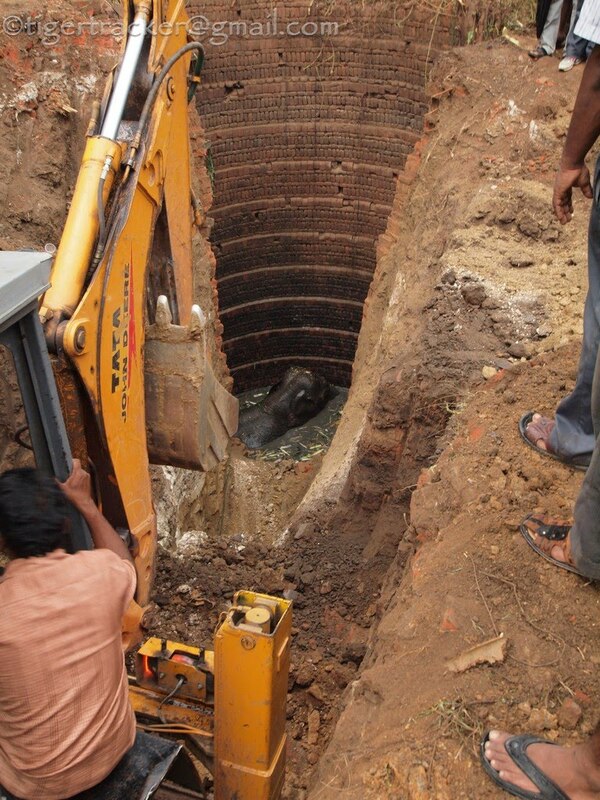 So the only way to get a reasonably large pachyderm is to lift it out bodily with a crane, which in this case was impossible because the object of interest was some 25 feet below ground level and swimming in a 6 feet deep pool of slush, hardly 12 feet across! Every time the arm of the earth mover scraped the mud there was panic at the bottom of the well. The elephant, scared out of it's wits was going around in circles, searching for non existent exit. The operator of the earthmover was in his own state of panic, worried that the elephant would come charging out once it realized the trench appearing gradually was an escape route. 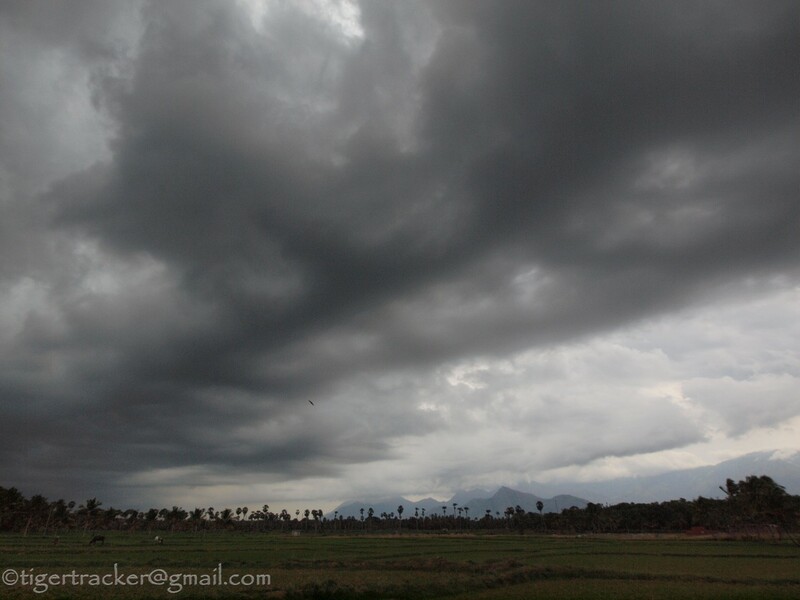 It was getting dark and the drizzle was building into a steady downpour. The news was that the elephant in the well being wild had to be shepherded to the safety of the jungle over land. 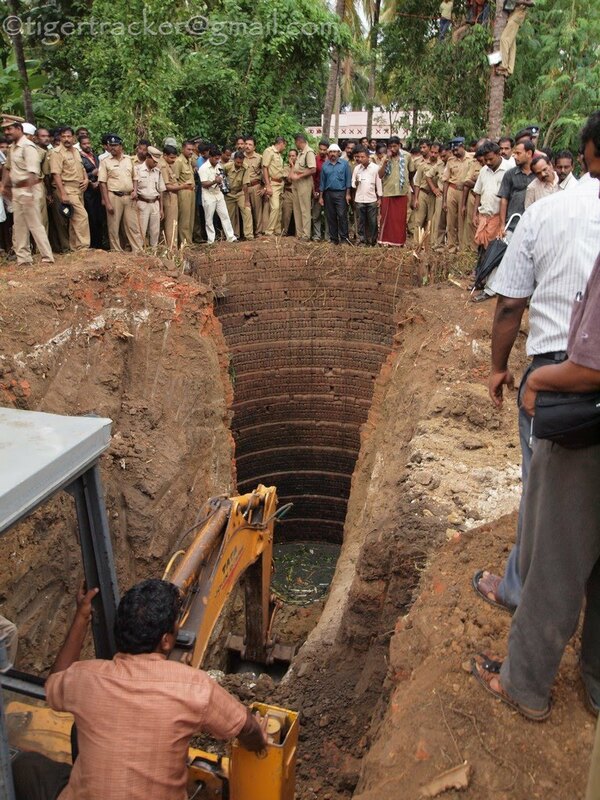 For this purpose they had requisitioned some trained elephants from Top Slip in Tamilnadu. That was not going to happen before midnight. The sky looked threatening so we decided to go back and I planned to return later but the "kunki" (trained) elephants from across the border reached at 1 AM and the one in the well happily walked out of the well at 2.45 AM. I'm only surprised that the elephant walked out intact. Except perhaps a bruised ego, nothing to suggest an injury!